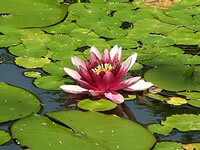 There are about fifty species of Water Lily plants, inhabiting every part of the world. sometimes fragrant, star shaped flowers to the surface. have larger flowers, and come in some really HOT, exotic colors. 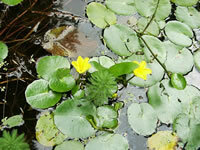 Several species of tropical Water Lily are night blooming as well! 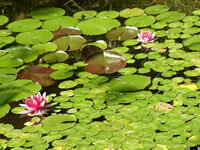 Hardy Water Lilies are very durable and easy to grow water plants for the beginner. They will bloom continuously from spring until fall if dead flower stems are removed at the soil level regularly. Each flower will open at dawn and close at dusk, for 3-4 days before and sinking from sight and fruiting. Most commonly available Water Lily plants are hybrids bred for several North American species. 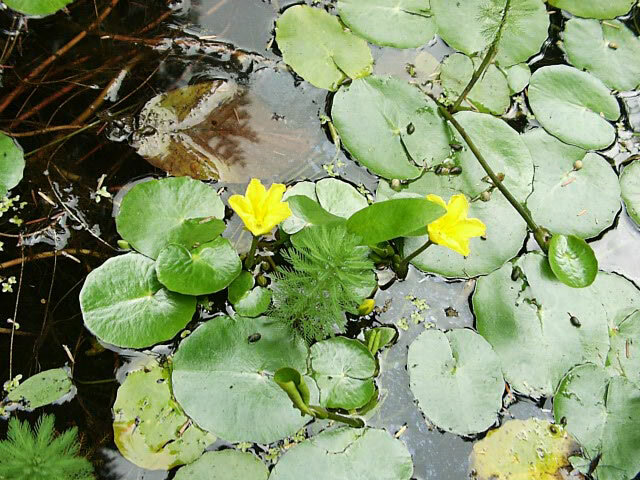 Some species of Water Lilies can become a weed in some areas, so beware! 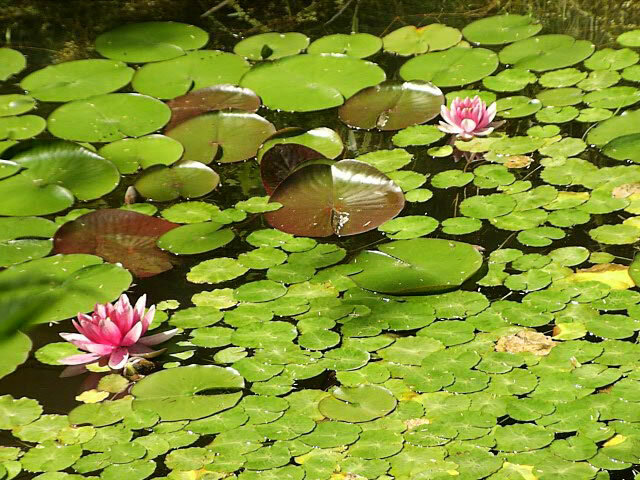 Like any other perennial, each different Water Lily may have specific needs when it comes to their sunlight, soil, fertilization, water depth and pruning requirements. When shopping for Water Lilies, be sure to check the requirements of that specific plant, before you decide that you must have it! 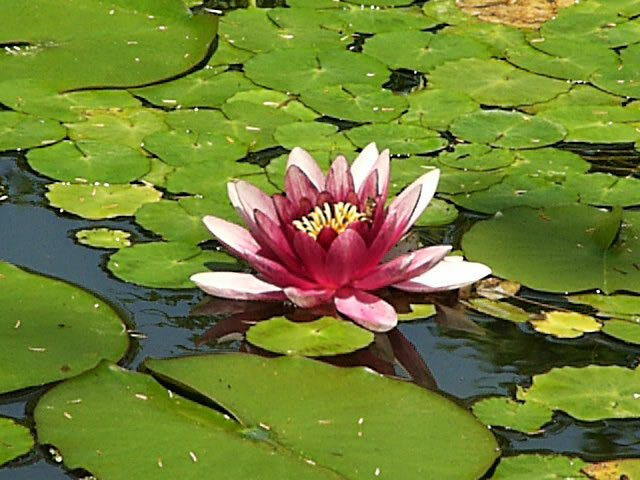 Generally, Water Lilies require a minimum of four to five hours of full sun each day to produce the most blooms. They should be planted in a large, wide pot, using a slightly acidic mixture of clay and loam with a pH of 6.1-7.0. Commercial potting mixes often contain amendments that float, so if you are using a commercial mix be sure that it is specifically for aquatic plants! as well as devouring the mosquito larvae. When planting, use a suitable container that is wide (12"-18") and shallow (8"-10"). Before planting, press 3-4 aquatic fertilizer pellets down into the soil. near the edge of the pot, pointed to the center, with the growing tip pointing slightly upward. Cover the soil with a 1" layer of small rocks or pea gravel to keep the soil in place. Lower the pot into the pond at an angle to allow it to fill with water gradually. The planter can be set at a 6" depth initially to give new growth a jump start. As soon as the first foliage hits the surface, it should be moved to a depth appropriate for the species or variety. and large varieties should be set at a minimum of 36". unless you plan on storing the rhizomes over winter. using aquatic plant fertilizer tablets which are pressed into the soil. All tropical Water Lily species will need to over-winter in a heated area! If your pond or tub freezes solid in winter, you will have to lift the pot and store it indoors for the winter. Remove all dead and dying foliage. Lift the planter from the pond and store the entire pot in a plastic bag, in a cool area. Optionally, you can remove and clean the rhizomes and store them in moist peat moss at 40°-50°. Dividing and Repotting Hardy Water Lilies Hardy Water Lilies should be divided every 2-3 years, depending on the planter size. Remove the soil from the planter with a water hose to expose the rhizomes. Divide the tuber-like rhizomes and replant them in the spring or summer.